All eyes turned to ice dance for a second straight night. The Shibutani siblings had become an easy duo to root for after helping clinch the bronze medal in the team event. 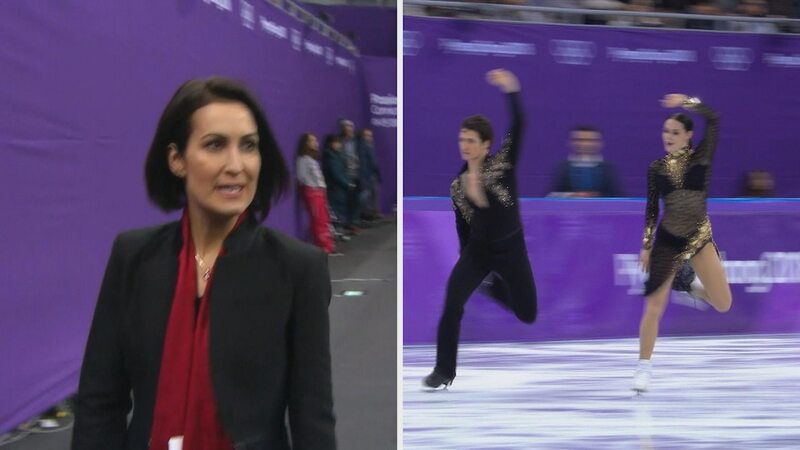 They had a tough task ahead of them as they were facing Tessa Virtue and Scott Moir of Canada, two of the most accomplished ice dance skaters. The Canadians didn’t disappoint, delivering a heart-felt performance on their way to winning gold. French pair Gabriella Papadakis and Guillaume Cizeron claimed silver after. They recovered from Papadakis’ wardrobe malfunction to earn the highest score ever recorded in a free skate. The “Shib sibs” were in a battle for the bronze with fellow Americans Madison Hubbell and Zachary Donohue. Ultimately the Shibutanis won, taking home bronze with a score of 192.59. After playing mind games in training run number two, Lindsey Vonn looked dominant in run three in the women’s downhill. Canada’s Cassie Sharpe met high expectations in the women’s freeski halfpipe, winning gold. American Brita Sigourney took home the bronze in a tight contest with fellow countrywoman Annalisa Drew. Reigning Olympic champion Maddie Bowman had a disappointing finals showing. There’s not one but two champions in the men’s bobsled event. Canada and Germany tied for the gold medal after having an identical time through four rounds. Latvia took home the bronze medal. It was an exciting final run in the bobsled as only .13 seconds separated the top five spots. It was the first tie for gold in the bobsled since 1998. Justin Olsen and Evan Weinstock finished as the top Americans. Olsen made headlines after needing an emergency appendectomy in Pyeongchang. The other two American teams, Nick Cunningham and Hakeem Abdul-Saboor and Codie Bascue and Sam McGuffie, did not get to complete a fourth run after finishing 21st and 25th, respectively. All six of the men will have a chance to finish higher in the four-man competition. Tessa Virtue and Scott Moir won the figure skating ice dance competition with a score of 206.07, becoming the most decorated Olympic figure skaters in history. The Canadians already won gold in the team event in Pyeongchang. The duo set a short dance record on Sunday, which set them up to claim the title. The pair has hinted that their free dance could have been their swan song and they will retire after the Olympics. French duo Gabriella Papadakis and Guillaume Cizeron took home the silver in their Olympic debut. It was their turn to set a new record: In the free dance, they earned a score of 123.35 points. Papadakis had an unfortunate wardrobe malfunction during the short, which affected the pair’s score. For the Americans, brother-sister pair Maia and Alex Shibutani continued from their strong performance in the short dance. By winning bronze, the duo continued Team USA's ice dance medal streak, which began in 2006. 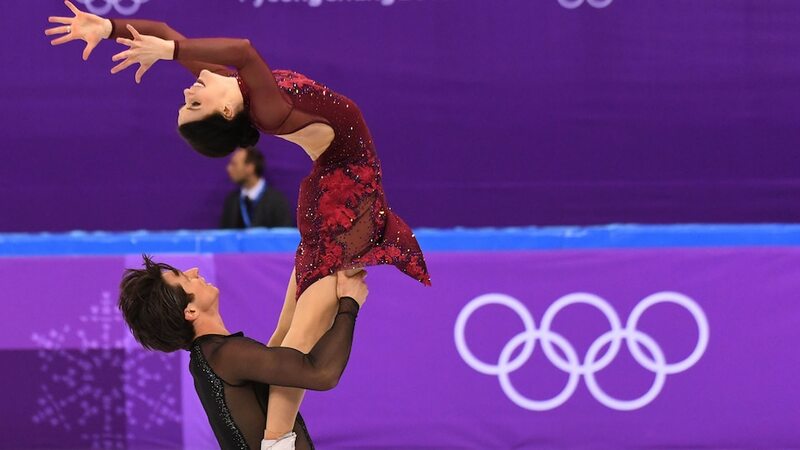 They are the first siblings to win an ice dance medal since 1992. Madison Hubbell and Zachary Donohue were ahead of the Shibutanis by .02 points heading into the free dance. However, they fell to fourth after a few minor mistakes in their free dance routine. The pair was skating in their first Olympic Games. Rounding out the American squad, Madison Chock and Evan Bates had a bad night. They finished ninth overall after tripping on each other’s skates. The trip cost them two points and left the pair wondering what could have been. A fall in ice dance is much rarer than in the traditional men’s or women’s events. Canada’s Cassie Sharpe was favored to win the gold medal in the women’s freeski halfpipe, and she didn’t disappoint. She took home the gold with a score of 95.8. She led after landing cork 900s in different directions on her first run and never gave up the lead. In her second run, she managed back-to-back 900s and a cork 1080, which no one could compete with. France’s Marie Martinod landed a 1080 as well to help claim the silver medal. It was her second-straight Olympic silver medal. Martinod came out of a five-year retirement right before the Sochi Olympics. At 33 years old, she was the oldest skier in Pyeongchang. For bronze, it was a race between two Americans, Brita Sigourney and Annalisa Drew. Sigourney ended up capturing the bronze. She had huge height on her final run, which helped her earn a 91.6 and boot Drew off the podium. It’s Sigourney’s first Olympic medal after finishing sixth in Sochi. Maddie Bowman had a disappointing and difficult finals. She was the reigning gold medalist in the event. She couldn’t land a run and ended up in 11th. She was attempting back-to-back 900s in her runs and crashed on the final 900 on all three runs. The last crash looked particularly painful for Bowman as she got up in tears, perhaps in part because she knew she had failed to meet high expectations of a back-to-back title. The women had their third and final training run in the Alpine downhill. Lindsey Vonn looks ready to reclaim her title in the event. She had very fast section times again, but stood up at the end to slow her overall time of 1:40.16. Mikaela Shiffrin announced she wouldn’t compete in the downhill after the super combined was moved up a day due to expected bad weather. Shiffrin still took the final training run finishing with the fifth best time of the day. She was the fastest of the slalom specialists, which sets up a promising super combined. After Shiffrin’s withdrawal, there were four other Americans competing or three spots aside Vonn. Stacey Cook finished yesterday’s training run in significant pain after crashing right before the Olympics. She did not take her training run today, and it was announced she would not compete. Breezy Johnson, Alice McKennis and Laurenne Ross will compete. They finished 12th, 17th and 18th respectively in the third training run. Vonn’s biggest competition is expected from rival Sofia Goggia. Goggia won the downhill test event last year in Pyeongchang. Tina Weirather, Stephanie Vernier and Ramona Siebenhofer are all expected to be medal contenders. 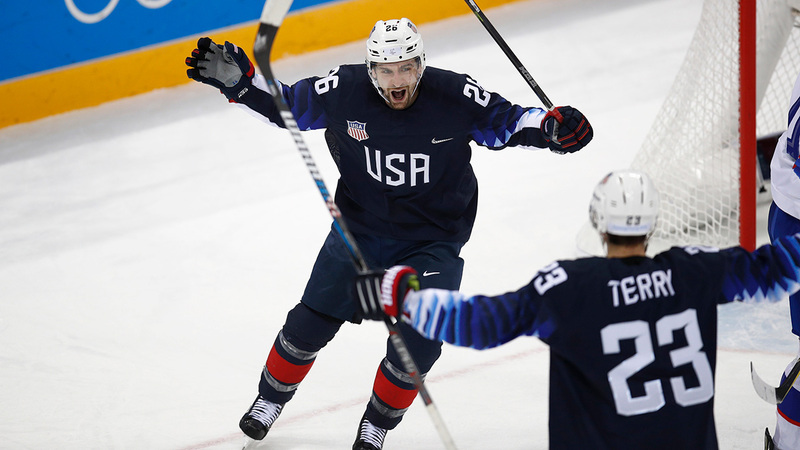 The U.S. advanced to the quarterfinals of the men’s hockey tournament after beating Slovakia 5-1. The U.S. will play the Czech Republic at 10:10 p.m. ET. Ryan Donato scored the first and fifth goals of the game. Donato has scored four goals this tournament, all of them against Slovakia. Donato, a college player, is tied for the lead in goals scored with two Olympic Athletes from Russia (Ilya Kovalchuk and Kirill Kaprizov). Troy Terry also had a strong performance in the game. He assisted on the first three goals of the night for Team USA. He is also one of the team's collegiate players. James Wisniewski, Mark Arcobello and Garrett Roe all scored their first goals of the tournament in the offensive outbreak for the U.S. Goalie Ryan Zapolski made 22 saves for the U.S. In the other quarterfinal game, Norway defeated Slovenia 2-1 in overtime. It was Norway's first win in Olympic men's hockey since 1994. They will face the Olympic Athletes from Russia in the quarterfinal. 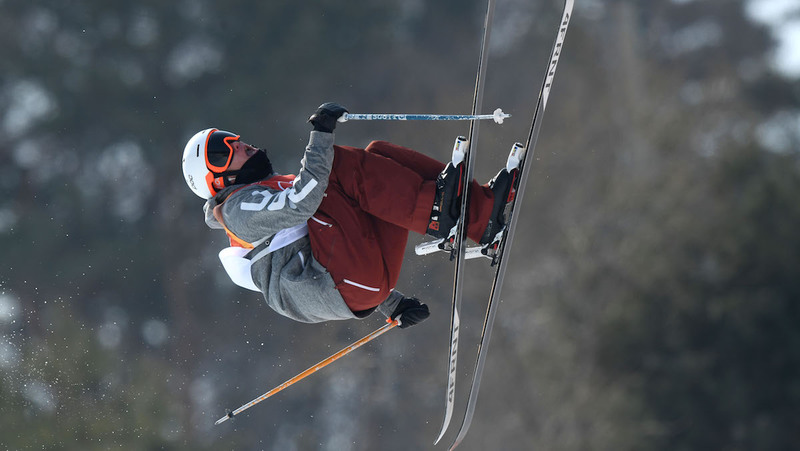 All four Americans qualified for the ski halfpipe final. The possibility of a sweep is still alive after Aaron Blunch, David Wise, Torin Yater-Wallace and Alex Ferreira all qualified. Blunck posted the highest score of the qualifying round. Wise is the defending gold medalist. Ferreira and Yater-Wallace finished with the second and third best scores. Wise fell on his first run, so he did a more conservative second run to ensure he made it through to the final, and he finished eighth. An American sweep isn’t unheard of. Right before the Olympics, at the X Games, the Americans swept with Wise, Yater-Wallace and Ferreira all reaching the podium. The U.S. only has three podium sweeps in Winter Games history (1956: men’s figure skating, 2002: men’s snowboarding halfpipe, 2014: men’s ski slopestyle). They will have to face the returning silver and bronze medalists from Sochi, so it’s definitely not a given. The final will take place Thursday (Wednesday night in the U.S.). The U.S. women’s team was facing South Korea and had to win to remain alive in pool play. If South Korea won, they were guaranteed to advance to the semifinals. Ultimately, South Korea won 9-6, securing them an unexpected spot in the semifinals. Korea is now 6-1 overall. In other matches, China beat Canada 7-5. After starting the tournament 0-3, Canada had to win out to stay in contention for reaching the semifinals. The defending gold medalists still have a slim chance of reaching the semifinals, but it is highly unlikely. Great Britain beat Japan 8-6, which keeps Great Britain’s seminal hopes alive. The women had the 1000m qualification heats in short track speed skating. Great Britain's Elise Christie, who is notorious for her Olympic bad luck, had another fall in her final race. She had to be carried out of the rink by coach. She was disqualified for interfering with another skater. Christie suffered an ankle injury in the 1500m. Despite being the reigning world champion in the 1000m and 1500m, she has never won an Olympic medal. She made her Olympic debut in Vancouver but wasn’t as dominant as she is today. In Sochi, she was a medal favorite but was disqualified in all three of her events. Americans Jessica Kooreman and Lana Gehring also did not advance. Kooreman finished third in heat four after attempting to pass in the final lap. However, she couldn’t pull off the pass and does not advance. Other international competitors include Shim Suk-Hee who won the first heat. She won three Olympic medals in Sochi but failed to advance out of the heats in her first two events in Pyeongchang. She is looking for redemption in the 1000m. Her countrywoman Choi Min-Jeong, who won a gold medal in the women’s 1500m on Saturday, also qualified. Italy’s Arianna Fontana is already a six-time Olympic medalist but is looking to add another medal to her collection.